The facility where many statewide court cases are heard was damaged by gun shots over the weekend. Six windows at the Cole County Courthouse in Jefferson City were taken out by shots fired. Bushman says he walked over to the courthouse at about 7 a.m. Monday when he encountered several sheriff’s deputies who were investigating the gun shots. 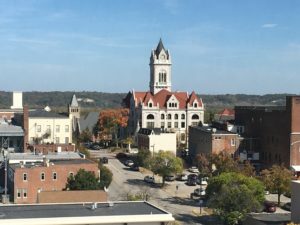 The Cole County Sheriff’s Department is looking into the incident and well as the shooting over the weekend of a window at the building which houses the public defender’s office in Jefferson City. Bushman thinks the extent of damage indicates a larger caliber weapon was used than a BB or pellet gun. He says the windows being replaced at the century old stone courthouse are oval shaped and all have slightly different dimensions, which is why they have to be specially ordered. No disruption to the courthouse’s operations is expected because of the window damage. Among the major court suits litigated at the Cole County Courthouse in recent months was a case involving arguments over whether Constitutional Amendment 3, which would increase taxes on cigarettes, should be taken off the November ballot. It’s not known if the gun shots were acts of random vandalism or motivated by a specific reason.